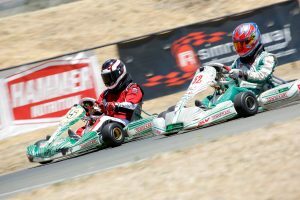 Round 2 of the KPX Karting Championship, powered by Briggs & Stratton, took place at beautiful Simraceway in Sonoma. KPX and Simraceway teamed together to put on a flawless show with everything running smoothly. The drivers put on an unforgettable show with an unbelievable amount of passing that kept the fans on the fence anticipating the next pass. Tech and race directing was very strict keeping the series in line with their promise for fair, competitive racing. Friday practice surprised everyone with a turnout of 80, or so, karts filling the paddock making it hard to believe that there would be enough room on race day. The trailers kept rolling in Saturday morning packing the parking lot. KPX and Sonoma did a great job of keeping to their published schedule even with their largest turnout yet. 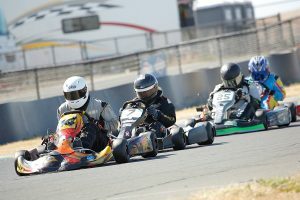 94 karts came to race strapped with their Briggs & Stratton power plants, comprised of 88 LO206’s and 6 World Formula’s. The Junior 1 class showed up with 18 of the best, young drivers around. 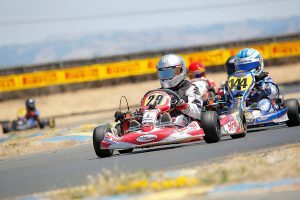 Aiden Kempf came off a win at Stockton with P2 in qualifying getting edged out by Kai Sorensen by 3 hundredths of a second. The top four guys went at it in the Pre-Final, passing each other multiple times. Sorensen got a last lap pass to beat out Aiden Kempf. Dominic Gordon came on strong in the Main event fighting off his competitors with seven or more passes back and forth to cross the line in P1. Unfortunately, Gordon got a mechanical DQ that cost him the race leaving Sorensen with a much deserved win. Garrett Randolph came from fourth to finish P2. Kempf dropped back finishing P3. The talent in this class is just amazing. In the Junior 2 class, 18 karts arrived to challenge each other. Tomas Mejia started in his first ever KPX race qualifying on pole. Going into the Pre-Final, Wyatt Couch and Hayden Wagner made Mejia work hard to earn his win with multiple passes between first and third finishing within two tenths of each other. With a little pressure in the Main event Mejia held off Couch and Wagner for the win by only one tenth. Couch P2, Wagner finishing P3. Due to the high kart count, the Senior LO206 group was split into “A” and “B” groups. KPX figured this would be a good way to keep the racing clean and competitive. A total of 31 karts entered this class. The way this worked was the top 14 qualifiers would make the “A” group guaranteeing them a spot in “A” Pre-Final and Main event. The remaining 17 qualifiers would start in the “B” Pre-Final with six transferring to the back of the A-Main event leaving 11 racers to fight for a B-Main win. David Vasquez was fast man getting himself pole position. The six people who fought to advance from the “B” Pre-Final to the A-Main were Eric Nascimento, Zachary Rivera, Nicholas Grossi, Andrew Cyrus, Logan Mitchell, and Cameron Imhoff. The B-Main was dominated by Nick Martin pulling a five second lead to win. In the “A” Pre-Final there was some unbelievable racing between Vasquez and Kenny Manchester, passing each other at every opportunity, although Manchester pulled out a last turn pass under Vasquez for a photo finish. The A-Main was again a show to see. The top 4 guys Manchester, Vaquez, Hunter Corbitt, and James Selby were swapping spots, someone even said, “it was just like a chess match”. All four of the leading pack finished within 2 tenths of each other. Vasquez got the win, Manchester P2, Corbitt P3, and Selby P4. Hard charger Grossi, from the “B” transfer, made his way all the way up to finish 10th. The Masters LO206 class is becoming a huge class with so much talent. 20 of the best 35 and older drivers arrived to see who is the best. Brian Rivera came out strong with P1 in qualifying. Bob Snow came on strong in the Pre-Final to pick up the win with Joe Senna, Brian Gallagher, and Rivera right behind him. Going into the 20-lap Main was anyone’s race to win. Unfortunately, a bad crash in the first corner put the race on hold, but thankfully everyone was okay. Rivera came on strong in the Main leading a good majority of the race, but Snow didn’t give up and made a last lap pass for the win. Bad news for Rivera as he took a DQ for being under weight by 2 pounds. This left Senna with P2, and Mat Kattanek P3. World Formula showed up with a great small group of six racers. Steven Taylor got P1 in qualifying. Dennis Holmes got a great start to hold off Taylor by just enough to get the Pre-Final win. When the Main event came, Taylor’s day went bad only completing one lap, which left Dennis Holmes all alone out front to take home the win. Rich Huston came in P2, with Wayne Bundy P3. The series has a massive amount of support from the local tracks, racers, and all the sponsors, two of their biggest being MG Tires, and Briggs & Stratton Racing. 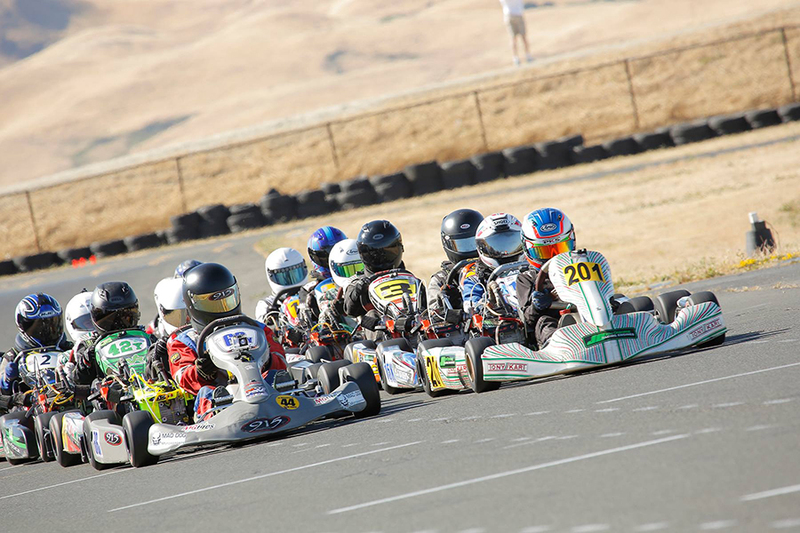 Round 3 of the series will take place July 17 in Davis, CA at Bluemax Kart Club.